The requests for penthouses for sale in the San Pedro area of Marbella has become higher and higher, but there’s only so many to choose from! Penthouses are a sought after property, not only because they are usually larger than the apartments in the same building, but also because they often have better terraces, better views and are almost always on 1 level, making it an ideal property for those that don’t like using stairs. 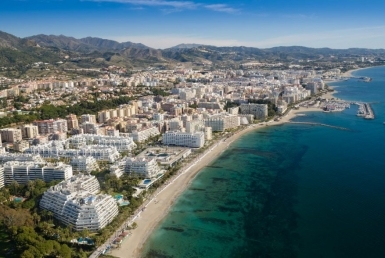 At DB Marbella Real Estate, we have a vast selection of penthouses for sale in the San Pedro area of Marbella and below we have made a selection of our top 5 favorite penthouses currently for sale. 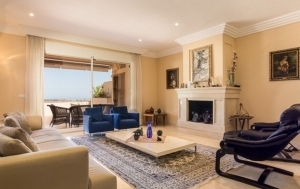 This beautiful spacious penthouse is located in the sought after area of La Campana, Nueva Andalucia. It has an extraordinarily large terrace and equally spacious living/dining room plus it has 3 large bedrooms and a fully fitted kitchen. The terrace, which faces west, give great views towards the Marbella Mountains and lush greenery surrounding the development. 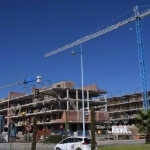 This penthouse located in Nueva Andalucia not only gives a great view towards the mediterranean coast, but also on the green areas of the development and its large communal pool. This makes this apartment great for people with kids if they want to keep an eye out for them from the comfort of their own terrace! 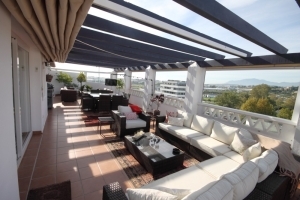 This exclusive penthouse for sale in the area of Albatross hills beasts a fantastic spacious living area with dining rooms, large terraces and 3 superb bedrooms all of which are en-suite. The kitchen area has another small dining area and the terraces all have different orientations so you can enjoy both the sea and mountain views. We kept the best for last… this superb immaculate penthouse ticks all the boxes and then some! It have been completely designed and refurbished giving the place a great “Feng Shui” feel. It’s impressive roof terrace allows you to see far and wide in 360 degee. So this is our favorite selection this month on penthouses for sale in the San Pedro area of Marbella. These homes are all listed with our real estate agency and we know the owners personally, so if you wish to arrange a viewing, don’t hesitate to get in touch with us. For more properties like this, please visit our Featured Marbella Properties page and have a browse through out extensive list of excellent properties in this area!